Children under 6 living in urban communities were more likely to have parents who said they had low levels of social support1 than those living in rural communities. 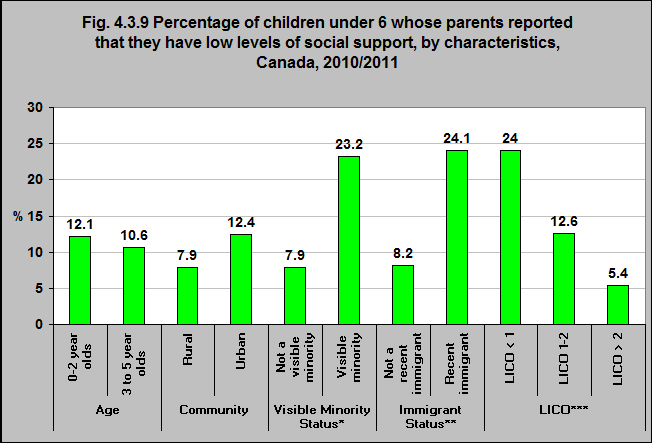 Children under 6 who were from a visible minority group were almost three times as likely as those who were not part of a visible minority group to have parents who felt they had low levels of social support. That was the same for children who were recent immigrants – they were three times more likely to have parents reporting low social support than those who were not recent immigrants. Children living in low income households are more likely to have parents who feel they have low social support than children living in higher income households.